Leamington chairman Jim Scott says the club’s relegation from the Conference North makes their move to Gallows Hill even more imperative. Despite a 2-2 draw with North Ferriby last Saturday, results elsewhere consigned Brakes to the drop and emphasised the harsh realities of trying to compete in a division overflowing with teams with considerably more financial muscle. And Scott, who on Thursday confirmed manager Paul Holleran will remain in charge next season, said the club will always struggle to compete on equal terms while they are based out on Harbury Lane. “We over-performed to win the Southern Premier in budget terms, it’s as simple as that,” said Scott. He added: “We’re far more reliant than we want to be on matchday revenues. “Our bar generates £45,000 a year where it is. “People don’t want to come. It’s seen to be in the country. It’s perceived as the middle of nowhere. It’s a simple fact. “People in Leamington wouldn’t think twice about getting in a taxi two miles to Warwick but they don’t want to take a taxi down a country lane. “To be at the heart of the community we have to be accessible. 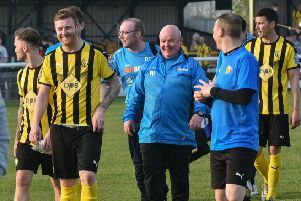 Brakes’ reluctance to compromise their financial security led to the high-profile departures of Liam Daly and Tony Breeden in the close season. But even had he forseen the club’s subsequent relegation fight, Scott said he would not have tried to compete with the riches on offer at Solihull Moors. “It never became a discussion, the figures were so far apart. We couldn’t afford the figures. They are earning more than double elsewhere. “We’re not talking £50 or £100. We’ve never lost a player for £50 or £100. “Would we have done it differently? No. “One of the options would have been to find money for key players. “If everyone is on £500, £700, £800 it doesn’t tend to be an issue.